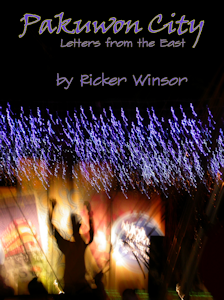 Ricker Winsor is a painter, writer and world traveler. 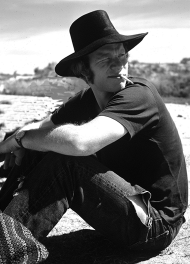 He has worked as a photojournalist, cabinetmaker, teacher, and as a Delta blues musician, guitar and vocal. Ricker is an expatriate living in Surabaya, Indonesia with his Chinese Indonesian wife, Jovita. His essays and short fiction have been published at “Reflets du Temps” in France and at Empty Mirror Books, which also shows some of his paintings. He has published three books with Mud Flat Press: Pakuwon City, The Painting of My Life, and Tik Tok: Poems. Mud Flat Press: How did you come about writing Pakuwon City? Some of the history is like this. My father was a writer and I was an English major. Whatever thoughts I had as a teenager about what I might do in life centered around teaching English and writing. That was because I liked English, especially discussing and analyzing stories and I was good at it. About writing, well, I thought if I was going to do that I needed experiences. Funny how we think we have to go somewhere for those experiences when it is all right here now in our own lives. I wrote some magazine pieces when I was working as a photojournalist in New York City back in the sixties but it was a long time before I wrote with any personal purpose. About seventeen years ago I bought a super motorcycle, a BMW 1200 RC, and I started taking trips into Canada, Idaho, Montana, Oregon, camping, knocking around. It was great. I love being alone with my thoughts. I had a word processor and started writing sketches and sending them out to friends via email. People liked them and one of my friends, someone I respect very much, said, “Somewhere along the line, you learned how to write.” That was significant for me and I knew he was correct. It just happened, probably naturally from the way I think and by the process, over years, of refining my thinking inside my own head. And then a big adventure happened. Rather than join a monastery, which I was in the process of doing, I took a job teaching in Bangladesh for two years. That’s when I started pulling my stories together and writing new ones about Bangladesh. A few years later, after some time back in Vermont, I was back in Asia, in Indonesia, with a lot more to write about. I guess the process of writing Pakuwon City, Letters from the East actually took six or seven years. Alec and Gabi Clayton at Mud Flat provided all the support, did editing, and guided the publication process. Writing the book was a tremendous pleasure. I would be giggling to myself as I was writing and that got into the prose, to very good effect as I was told by some of my smart supporters. I wish I could still write like that, so light-hearted, but I can’t. Things change; we change. That kind of innocent fun is beautiful but transient, a hot house flower. MFP: You mentioned time in Bangladesh and then time back in Vermont and back to Indonesia. Could you lay out the timeline for us, when you did what? RW: In 1994 I left my twenty-year relationship with my French partner, Francine Vidal, changed careers, moved three thousand miles, got married, got divorced, and my mother and my oldest sister died. What that did to me emotionally has taken me years to understand, since my way is to keep sailing no matter what, not the best way from a psychological point of view. But there I was, no longer building furniture and cabinets, working in the barn on a hill farm a mile from the nearest neighbor in the Catskill Mountains of New York, but in Tacoma, Washington as the new head of the Art Department at Charles Wright Academy. I lived on Vashon Island and am happy for that experience. After eight years there I took a job as AP Studio Art Teacher at the American International School of Dhaka, Bangladesh. And, after two years there, I returned to the Upper Connecticut Valley of Vermont and New Hampshire where I had lived previously for fifteen years and where my long time best friends live. I built a house on ten acres in Bradford, Vermont and got a job at Dartmouth College, where I had worked previously as an exhibits designer. This time I was part-time in the Music Department, a nice job that allowed me time to paint and continue writing Pakuwon City. Unfortunately, after the money grubbing meanies of Wall Street trashed the economy in 2008, my job was eliminated, and I was thrown back on living by the skill of my wits like Brer Fox of Uncle Remus fame. I got into action with my computer and three weeks before the start of school in Surabaya, Indonesia, I got hired. Those might have been the busiest three weeks of my life but I showed up, a la Woody Allen, and had a good year. Problems with the tenants back home and some other problems convinced me to go back to Vermont and my fiancé followed a few months later. We were married in a cow pasture by the local justice of the peace, Shirley Beresford, at her farm. And then, understanding that Vermont life was not a great fit for my wife, and that I was not going to be able to support us without a lot of stress, we took off again, this time to Trinidad for two years at another school, then to Bali for two years, and, finally, to Surabaya again, my wife’s home town, where we are now and where I still teach, this time teaching teachers two days a week. It does seem like more than a lifetime and that is not the half of it. MFP: You said, “I wish I could still write like that, so light-hearted, but I can’t. Things change; we change.” Can you elaborate on that a bit? RW: Pakuwon City has a droll humor running through it and, actually, in a current essay, “Getting to Know You, Indonesia,” which will be published in Paris next month at Reflets du Temps, I have been able to recapture that tone to some extent. I think as I developed as a writer I wanted to see reality “straight up,” not pulling any punches. I didn’t spare myself or anybody else and I know some people I wrote about, even with changed names, were hurt by what I wrote. There is a price we pay for honesty and sometimes a lie is the kinder thing. I understand that but I am not a liar and never have been. I began to take myself more seriously as a thinker and I wrote quite a few essays that explored things that disturb me, racism, violence, and loneliness, not happy topics. And although they are good essays, good enough to have been published here and there, they are also depressing. There is no avoiding the hard stuff but I don’t want to be stuck in it either. We can still have fun, and I intend to do that. MFP: Your next book was The Painting of My Life, in which you focus on your life as a visual artist. We know that you were friends with and influenced by some of the first generation abstract expressionists. Much of your current paintings and drawings have a van Gogh flavor to them. Can you say a few words about your artistic influences and what drives your visual art? RW: My mother and one of my sisters were excellent painters, and my father a writer and cartoonist. I grew up in a house with van Gogh reproductions on the walls, good ones, and I studied them carefully from a young age. I started studying painting consciously when I was sixteen because Tom Paxton was dating my sister Mary, the painter, and took her to the Museum of Modern Art. I figured it must be something to know about. At that time, 1961, the Museum of Modern Art was much different than it is now and much more focused, smaller, intimate. They were showing, other than the fine permanent collection, non-objective abstract art. This was daunting for a sixteen-year-old to understand, about as difficult as understanding modern jazz and Charlie Parker or Ornette Coleman, but I am a persistent person and tried to get what I could. The first abstract painting that really spoke to me was Motherwell’s “Elegy to the Spanish Civil War,” a big painting in black and white, big evocative shapes. I was studying Spanish at the time and knew about the Spanish Civil War so there was a connection and I could feel the painting’s pathos through the abstraction. That was the breakthrough. I became a photographer first, a good one associated with Magnum Photos in New York and Paris. Older friends of my brother-in-law, a talented guy, recommended that I look at paintings to learn more about composition so my trips to the museums continued. Museums and libraries are my favorite institutions, sort of like heaven to my mind. I started painting at age thirty, like van Gogh, when I was a graduate student at Rhode Island School of Design, a truly remarkable place. I was there with Jenny Holzer and a lot of talented students and teachers. I had already become friends in New York with Herman Cherry, a first-generation abstract painter. He was one of the smartest and most knowledgeable people about painting I ever met. We were close for twenty years until his death. I knew Willem de Kooning through him and Richards Reuben, llya Bolotowsky, and many others, Reuben Kadish, L. Alcopely, all very fine artists. Edward Dugmore, RIP, and I became friends and he is still one of my favorite abstract painters. Through Cherry, we got to be friends with Charles Pollock, Jackson’s older brother who lived in Paris. My French partner, Francine Vidal and I lived in Paris for a year in 1979 as I continued to study and paint. Charles Pollock was a fine painter but needed distance from his younger brother’s reputation. I just listened to the talk of all these people and tried to absorb what I could. With all that influence from the abstract painters, one would think I would go in that direction but I didn’t. I have made some good abstract paintings and will continue to do that as the spirit moves me, but my first love is nature, being in nature, responding to nature with oil paint or with India Ink and pens and brushes. My teachers at RISD, particularly Lane Smith, who became my close friend, were American Impressionists in a line following from Cezanne. My major influence is van Gogh, but also Matisse and Bonnard with Soutine and some others in the mix. Once I started painting, Cherry told me, “Van Gogh’s your man.” And, of course, I knew what he meant. Although I know Vincent’s work very well and have visited the beautiful grave where he and his brother Theo are buried side by side, I never consciously tried to imitate him. I believe it is a natural affinity we share that creates some similarities in our work. We share the same emotional intensity and I strive to get the control he was able to achieve while in the throes of all those feelings. For me, it is all about translating feeling through color and shape. When I am at my best outdoors, the painting almost makes itself. If it doesn’t happen that way, then it is a long struggle in the studio to make a canvas become all that it can be relative to my ability. 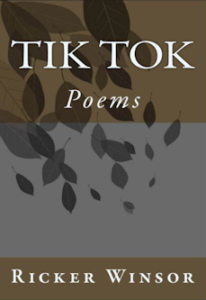 MFP: Your latest book is a book of poetry with drawings, Tik Tok : Poems. Have you always written poetry, and what periods in your life do the poems and drawings in Tik Tok represent? RW: I studied poetry in college, Dylan Thomas, Auden, Yates. Ferlinghetti, Ginsberg, among others, but it never occurred to me to write a poem of my own until, at age twenty-five, I experienced an emotional rebirth or epiphany. I was a “refugee from a wealthy family” as Joni Mitchell put it, living now in the deep north of Lyme, New Hampshire in a falling-down house with no indoor plumbing. It was intensely positive and energy driven, something impossible to describe in a way that would do it justice. People who have had those experiences would agree with me about that. I made my first crude, strong drawings at that time and I wrote and I wrote and I wrote. I kept the poems safe and didn’t think much about them until, in the last five years I started writing some short poems, thoughts that just emerged and seemed to be poetic, sort of like the hole in the dam that was plugged and then starts leaking, getting bigger and bigger. Some months ago, I realized I had quite a few poems, if they were poems; I wasn’t sure about that. So I sent five or six of them to friends who actually were poets, good ones. To my surprise, they all responded positively, treating me like a fellow poet. Then I thought about my drawings, which I have always liked the best of what I do, and it seemed natural to put them in my book, Tik Tok, as an accompaniment to my poems. Both the drawings and the poems span a period from the early seventies up to today. They all seem to arise from the same sensibility despite the factor of time, something that is very good from my point of view. You are just like a clock. You are always going Tick Tok. Among all the drivel kids write unthinkingly in those kinds of books, this stood out and has meant a great deal to me over the years. It is important and rare to be truly “seen” by anybody in this life. As an added note, I am in touch with Larry after all these years via Facebook, so I had a chance to thank him as an adult. 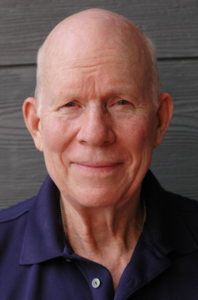 He is a Vietnam Veteran and had a career as a librarian, a special man. MFP: Is there anything you wish we had asked and haven’t? RW: I had every opportunity to be successful in the eyes of the world in countless ways. I turned my back on all of them. When I think about them late at night, I also remember that I consciously rejected them. Why? Because I was looking for something else. I understood early on that one pays a price for the choice to become an artist. The price is loneliness and poverty. One has to know that and accept it. I did accept it, and although the price is heavy I am closer to the goal and I am happy about that. And, somehow, my quest has been supported in unexpected ways so I didn’t have to suffer as van Gogh did or Alfred Jarry, people like that, so many. RW: I am collecting my essays for a book. Most of them have been published, but I want to select the best ones and put them between covers. And I paint and draw steadily and have recently had a breakthrough in that area. Although it is almost impossible here to have shows and be part of an art scene, I still am able to sell some paintings in the states, in Canada, and starting here now, to some business people. My goal about that is not money but to get as much of my work out there into the world as possible. I have distributed about one-hundred and fifty paintings like that, sold at various prices, and I know where about one hundred of them are. The great benefit to living in a big house is that I can see my paintings, about sixty on the walls, every day and make judgements about them over time. That is very important since I am not the best judge of my work and it takes me a long time to sort out that which is good from that which can be improved. So, the clock is still ticking, maybe with less energy because of age, but then with more focus and experience because of age. Nice summery Ricker….Quite a life! An inspiring read, thank you to my favorite high school art teacher! Thank you R.J. I am proud of all you have accomplished and there is lots more ahead! previous post: What part of speech is that?